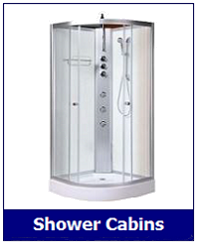 When these types of free-standing and self-contained showers are discovered for the very first time, many customers...and quite rightly so, have questions and concerns about the suitability for their own property and so forth. With this in mind and from our many years of experience and knowledge of this type of product, let us introduce you here to our Ultimate Guide. This will provide you with a plethora of valuable information on this topic - in fact, everything you need to know so you're able to proceed and complete a purchase with confidence and peace of mind. Any such Guide, does of course require a logical starting point and in this regard, we decided to commence with a concise introduction to the various types of showers that fall into this self-contained style. 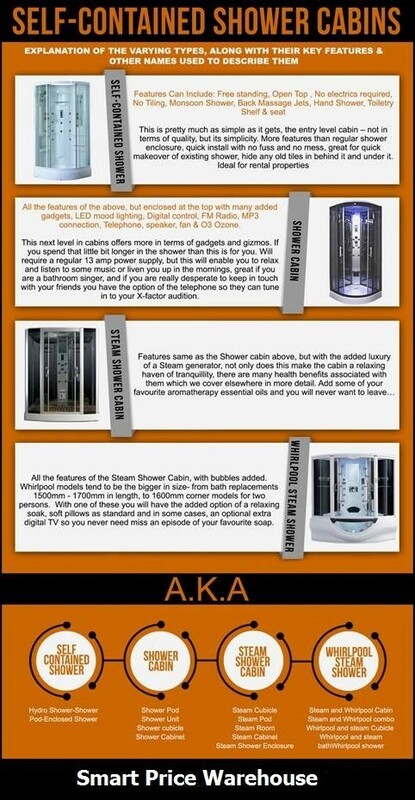 Steam Shower Cabin Buyers Guide - An Infographic from Smart Price Warehouse To share and embed this Infographic on your blog or website, copy & paste this code below. Part B: -Water Supply Requirements:- All these types of shower cabins require both a hot and cold water supply, accessed from in and around where the shower is to be finally situated. Find your type of water supply from the Infographic below and see if this type of self-contained shower is suitable for your property. 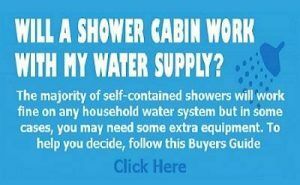 Shower Cabin Water Supply Requirements - An Infographic from Smart Price Warehouse To share and embed this Infographic on your blog or website, copy & paste this code below. Water Connections:- For corner units.. also known as quadrant units and with elongated models too, you will require the hot and cold water supply pipes to run up the wall in the corner. It is behind the corner control tower, where the water connections to the shower are made. Likewise with rectangular units, the control tower is normally in the centre of the back panel, so it will be on the wall directly behind this position, where the water pipes will need to be. Ideally, the hot and cold water pipes should run up the wall in the required position, approximately 120cm to160 cm from floor level. The pipe work will need to be fitted back tight to the wall and not protruding; this will ensure the cabin when in it's final operational position, will fit almost flush to the walls. 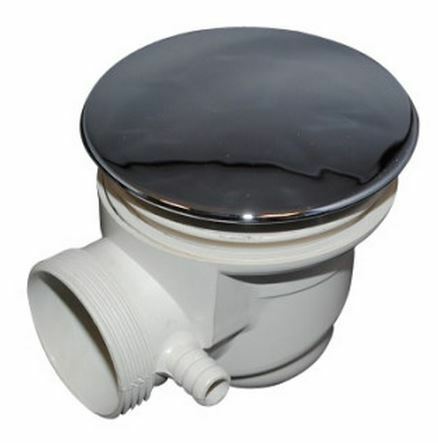 Where the hot and cold supply pipes have been run up the wall, it is recommended that in-line isolation valves, are fitted to the ends of the pipes. This will enable the water going to the shower to be shut off, should you need to carry out future repairs or maintenance work to the unit. 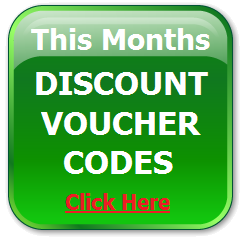 This is also handy if you are away from home for long periods of time, such as a holiday etc. Although we do not the supply isolation valves, your local DIY store will stock these or buy online at Toolstation for less than £1 each. This more or less covers the various water requirements and setup. Next, outline at the Electrical requirements. Part 3: The Electrical Requirements:- Obviously, if you are fitting one of the Hdyro showers as noted on the infographic above, then this section will not apply to you, as no electrical supply is needed. However, if you are planning on fitting a shower cabin, steam shower or whirlpool shower, then this section will provide everything you need to know. A standard 13 amp power supply will be required, by way of an Isolated Fused Spur socket. 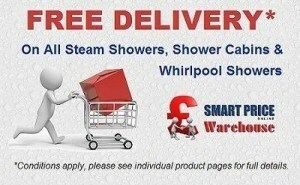 A single if for a shower or steam cabin, or a double if installing a whirlpool steam shower. 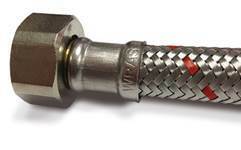 Your electrician will be able to supply these or buy online at Astra247.com . The fused spur socket needs to be positioned in and around where the unit is being situated and ideally at floor level. Alternatively, you can position this on an adjacent wall in another room and feed the shower cable through the wall to connect. Please ensure you follow local regulations; the fitting of electricity into bathroom must be carried out by a Qualified Part P electrician – this is now a Legal requirement. The shower unit will come with a pre-fitted plug, but this it meant for factory testing purposes only and is NOT for final use. It will also be pre-fitted with an RCD (residual current device). If you are connecting the unit power supply back to a mains board that is already fitted with an RCD, you should remove this as it will likely cause issues with the power tripping out. 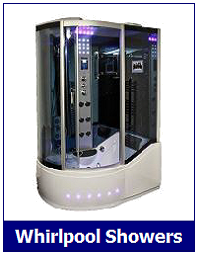 Shower Cabins will use very little power – Ceiling Light (AC12v/32W), fan (DC12v) Ozone (AC12v/8w), Tower LED Lights (12V/10w, Speaker (10w). 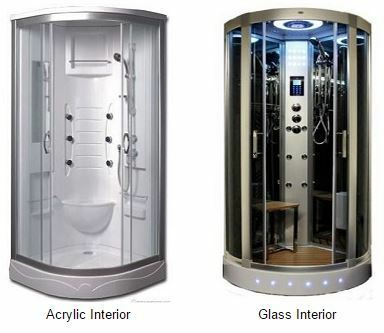 Steam Showers - Same as a shower cabin, with the added Steam Generator (3Kw). If you were to take a 20 minute steam you would use somewhere in the region of 1kw of energy, currently you are likely to be paying 10p-15p for this. Whirlpool Showers – As above with the power consumed using the whirlpool feature, generally fitted with 1HP motors. 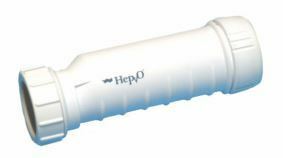 1HP = 746 watts, based on the above rates, this would add up to approximately 0.10p for 1 hour of usage. This finalises the electrical section. Next up – Space and Accessibility. Part 4: Space and Accessibility:- Unlike a conventional shower enclosure where as long as the tray fits the space you have available its fine, with a self-contained cabin you will need some additional space. Units are completely free standing, are not fixed to any walls or floor and the long flexible connectors for both the water supply pipes and waste, provide the ability to move the unit away from the wall, to gain access to the connections at the back. There is no access to any services from under the tray. (1) In the space that is available, will I be able to fully assemble the unit and then be able to get behind it to connect the hot and cold water supply and waste, the electrics and so on. 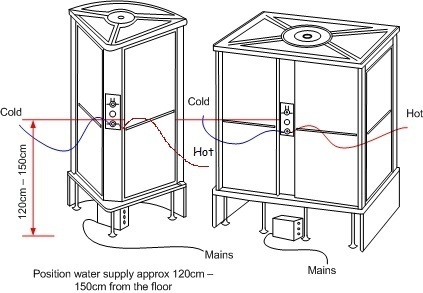 (2) Once the shower unit is fully assembled, connected and slid back into my planned final position, could I still slide the unit away from the wall and gain access to the back, to maintain and repair should an issue arise in the future. Another common error we come across, is customers thinking they can place a rectangular shower or whirlpool bath unit into a alcove or recessed area of their bathroom. 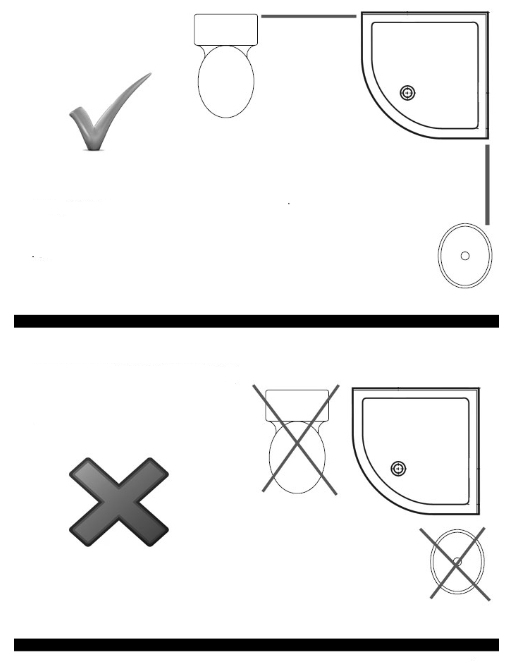 Please remember if the alcove is deeper than the unit and the width of the space is the same or only slightly wider than the size of the unit, you are not going to be able assemble this, connect up the services and have future rear access - in case of a leak for example, if there is no additional space available. If the unit is to be situated in a alcove or recessed area you will need around 400mm space to either side. The only exception to this, is to have access to the back wall area - perhaps through a hatchway from an adjoining room. This will overcome the problem of needing space either side of the unit for rear access. Finally, ensure that when you take delivery of your shower unit that you have somewhere large enough and more importantly, safe enough to store it. This is especially so when taking delivery a long time prior to fitting it. 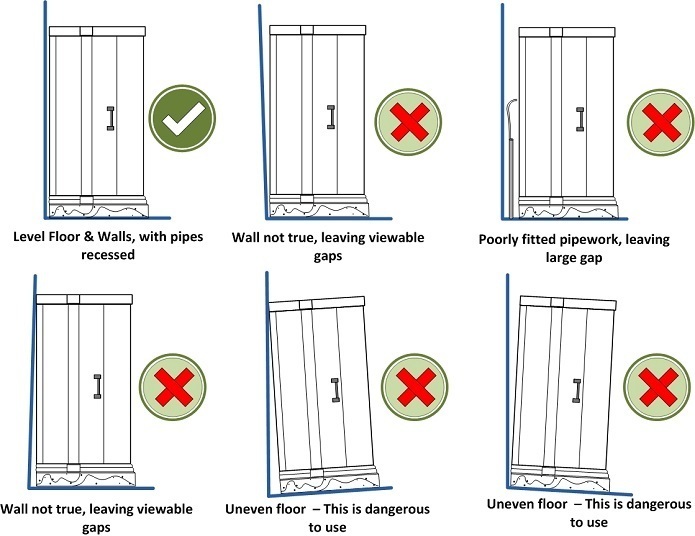 Shower units are very robust when assembled and connected, however flat packs of glass doors and panels are not so and replacing them can be costly and sometimes timely, if not in stock. Something that is often overlooked by customers, is because the rear glass panels are coated and you cannot see through them to the wall behind, they forget that although yes, the shower panels will hide those ugly old tiles from the 70’s, the walls must be upright from floor to ceiling. For example, if the tiles behind cover only half way up the wall, when the cabin is installed it will leave a gap where the unit cannot sit back flush, all the way from top to bottom. This can make the installation appear unsightly and unfinished. So do ensure you check not only the tile situation mentioned, but if the walls are indeed true and upright anyway. We also covered this earlier, but you really must also check the supply pipework behind is not protruding as again, this will force the unit away from the wall and once again, cause an unsightly gap. 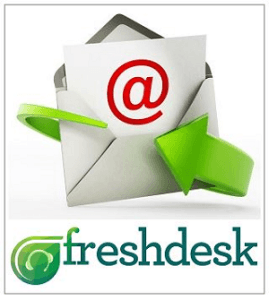 You ring our technical number and after going back and forth emailing images realise that the problem lies solely with the installation . The unit has to be un-assembled , silicone has to be removed and the floor levelled out as it should have been in the first place. At least a day or more has been wasted on cutting corners. Certainly not something to overlook and to get right in the first instance, for sure. Part 6: Acylic or Glass Interiors ? 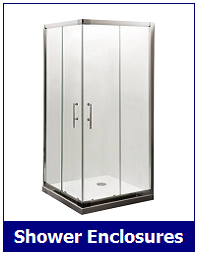 Acrylic - These type of shower units generally come with either glass or acrylic interior back panels. With acrylic interior units, you are limited to White only, everything tends to be moulded such as shelves and seats and they are usually a 1 piece moulded interior section. Certainly, this simplifies the installation process somewhat and qualities do vary in thickness of acrylic used. One advantage though, is visually the acylic does hide soapy residues that are more noticeable on a glass backed unit. Stability wise, glass is always going to feel more rigid and stable, however acrylic is by no means inferior and more down to personal taste as you are getting a more contemporary look and feel with acrylic and will certainly look great in any bathroom. Glass - Interior panels in glass, provide more scope in terms of colours and will have a totally different overall appearance to that of acrylic. The best selling finish over the years has been mirrored, which you won't obviously get with the acrylic option. Glass is naturally sturdy and rigid once in position . Darker colours will be harder to keep clean, or at least visually as residues will show up more, particularly on black glass. Certainly, you should consider adding the easy clean product that we offer Showerguard, as this will help out whoever is responsible in keeping the glass clean and smear free. You now have everything you need to know to decide your choice of self-contained shower unit and we hope you found the information helpful. 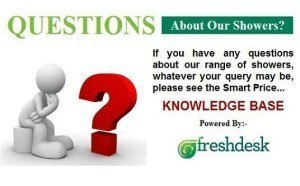 Should you still have questions unanswered, be sure to check out our online Knowledge Base and FAQ section. 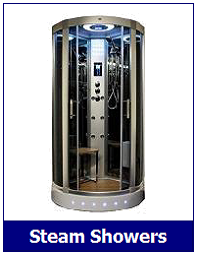 We also have our How To Guides area with many other aspects of Shower and Steam cabins covered, such as Health Benefits of a Steam Shower, Aromatherapy Essential Oils for Steam usage, How To Order, Delivery Process and many more. 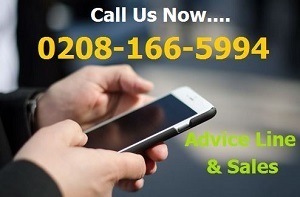 As always, if you wish to ask us anything please feel free to call Mon-Fri 9am-5pm and we will be happy to help 0208-166-5994. We also have live Online Chat and a Support Ticket system too - see here.